The first night we were in Boston was July 3rd. Our plans were to head over to the Hatch Memorial Shell to watch the Boston Pops full dress rehearsal. In preparation for their big 4th of July performance, the Boston Pops perform for a live crowd in a full dress rehearsal the day before. While the big day is the 4th of July, if you go on the 4th you almost have to choose what you want to do. If you wait to see the Boston Pops, you’re sitting in such a way that seeing the fireworks immediately after the concert is almost impossible. Or, you can save a spot along the river to watch the fireworks and listen to the Boston Pops on speakers set around the river, but you can’t see them. Besides the fact, going on the 4th of July means doors open at 9 am and seating is on a first-come, first-serve basis and the spots fill up before noon for an 8 pm performance. However, if you go to the rehearsal the night before, doors open at 5 pm for an 8 pm concert, the crowds are much less and you can watch the Boston Pops in a much more relaxed setting. While the concert isn’t exactly the same, it’s really, really close. And this is the best of both worlds, watch the Boston Pops perform live and for free the night before, and then on the 4th of July, find the perfect spot and watch the fireworks without having to sacrifice one or the other. Besides, for an 8 pm concert on the evening of 4th of July, gates open at 9 am, so our whole day is pretty much wasted spent waiting for the concert. We chose to go watch the Boston Pops on the evening of July 3rd. It was incredible. An experience I won’t forget any time soon. To make it easier for us, we booked a hotel that was within walking distance of the Hatch Memorial Shell so we could walk to and from the concert on the evening of the 3rd. When the concert was over, we, along with thousands of others, walked back through the streets of the Beacon Hill neighborhood on our way back to our hotel. About 2 blocks before we reached our hotel we strolled right past one of the few shops in the neighborhood that was bustling with people and activity. When we got closer, I realized it was an ice cream place, my favorite kind of place. People must have been stopping by to enjoy dessert before going home. If it was this popular, it must be good. So I told my husband right away that we needed to find some time to come back to this ice cream place and give it a try! When I got back to the hotel, I looked up the J.P. Licks and discovered it was Boston’s most popular ice cream joint. That was good enough for me. 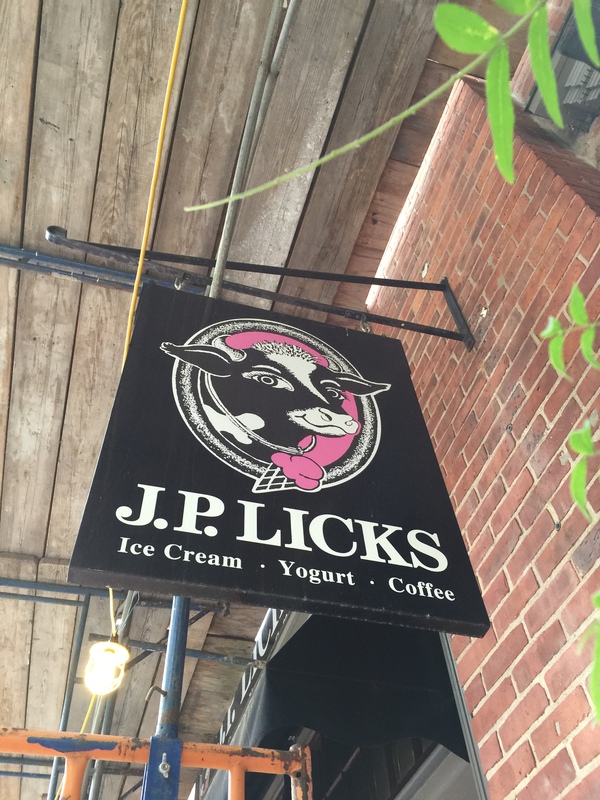 J.P. Licks, which markets itself as Boston’s “best place for homemade ice cream, frozen yogurt and fresh-roasted coffee” and uses an adorable cow for their logo is “eclectic” and “unique” as owner and founder Vince Petryk describes it. 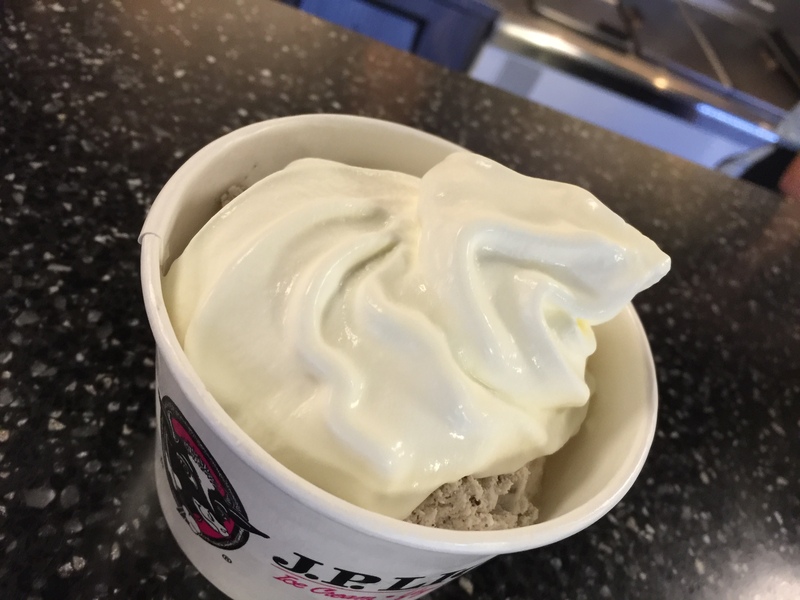 Having been in the ice cream business and industry for over 30 years, Vince and his then-partner started J.P. (which stands for the Jamaica Plains neighborhood of Boston) Licks in 1981 when he was just 26 years old. Originally reviewed as “not your traditional New England ice cream parlor,” J.P. Licks which initially only served handmade ice cream because churning out soft and hard frozen yogurt in 1987 and then began fresh roasting their own coffee in 1999, has now grown to 13 different stores in 4 Boston locations and 9 more in neighboring towns, none of which is more than 15 miles from their home base, which ensures a high level of quality products and services. Finally, in the afternoon on the 4th of July, we dropped into the J.P. Licks location not too far from the hotel to grab an afternoon snack. 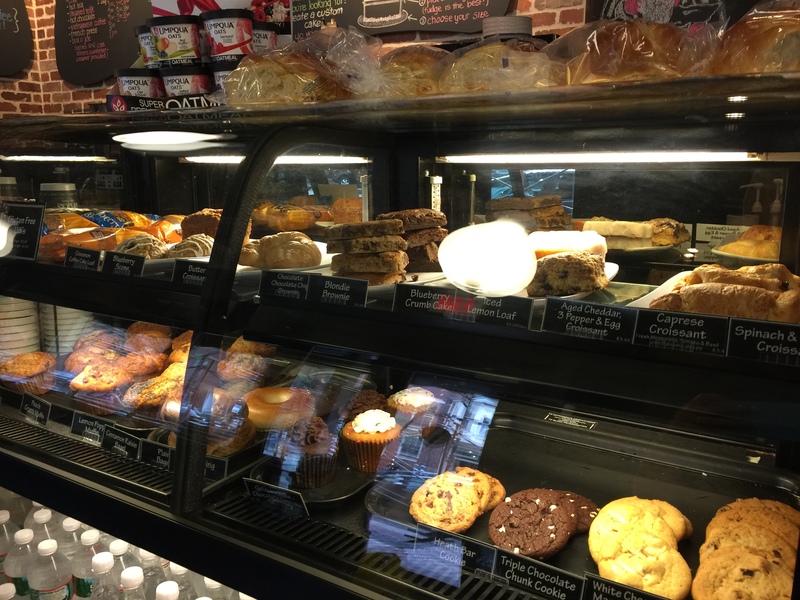 Even though J.P. Licks is known for their ice cream and sorbets, they also have baked goods and pastries as well cookies and, of course, coffee. So much to choose from that my husband and I said we might come back here for breakfast one morning. Though sadly, we never made it back. It’s a warm 4th of July afternoon, I’m going to bypass all the other sweet treats and go for the ice cream. I’m an ice cream fiend, and I’m not going to pass up the chance to cool down on this sweet treat. The minute I saw fresh banana on the menu, I was all over it. In fact, I ended up getting a two-scoop cup with a little topping of homemade whipped cream. One scoop of fresh banana and a second scoop of mint cookie ‘n’ cream. The fresh banana is described as being loaded with five pounds of fresh ripe bananas put into every batch of ice cream that they make. For me, this was the best banana ice cream I’d ever had. One bite of the banana ice cream and you could tell that it was fresh and that it was real fruit flavor without any additives or flavoring added into it. The ice cream had a subtle taste of banana, but it didn’t overpower you. It was sweet, but not overly sweet. It was like eating a creamy version of a fresh banana. Perfectly ripe, perfectly flavored. I loved it. This is what all banana ice cream should taste like. The mint cookies ‘n’ cream was also phenomenal. One of the main reasons I got this flavor, since I generally am not a mint chip type of girl, is because the menu said that the mint cookies ‘n’ cream was made with fresh mint, so it wasn’t the green color ice cream you normally associate with mint. Instead, it really looked like any normal, non-mint cookies ‘n’ cream flavored ice cream. However, one spoonful and you could taste the fresh mint taste of the ice cream. It was refreshing and cool, almost like sucking on a breath mint. 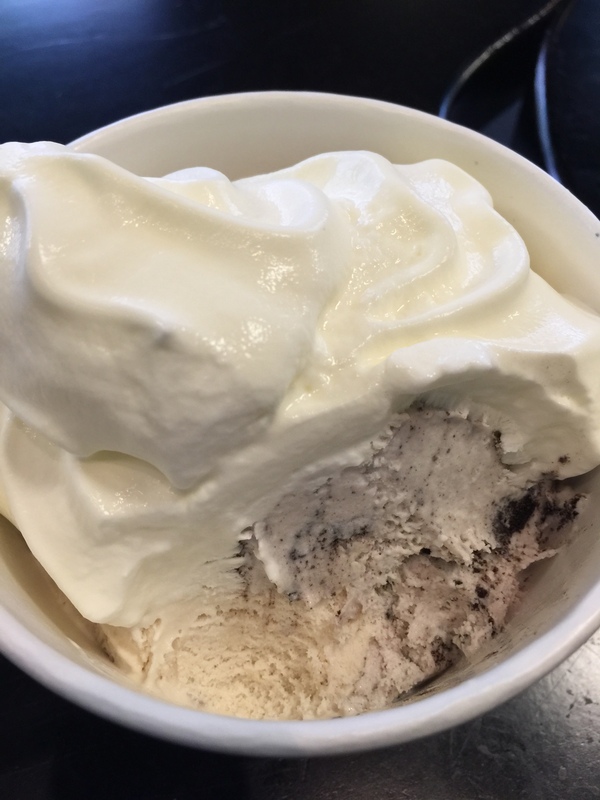 The ice cream was packed with cookies ‘n’ cream and the combination of the sweetness of the cookies ‘n’ cream and almost the sharpness of the mint flavor created a nice balance of flavors and tastes and actually in combination with the banana it was delicious. Fruity, refreshing and just a hint of sweetness mixed into the two flavors combined. It hit the spot on this warm July day. My husband also got a 2 scoop cup, but chose sorbets and sherbets for his selection. First off, he wanted the fresh watermelon sherbet. This beautiful pink sherbet is described as having tons of fresh watermelon blended into sherbet to create the perfect summer taste. My husband agreed that this tasted just like summer as it was cool, sweet and refreshing. You could really taste the freshness of a juicy, ripe watermelon in the cool refreshing form on a sherbet. When I asked him how it was, his words were that it was “summer in a cup.” His second selection was J.P. Licks’ fresh mojito sorbet. Described as using “fresh, hand-picked mint with a kick of white rum” it makes the perfect summer refreshment. One spoonful and my husband said that it definitely tasted like a mojito and it was awesome. My husband loves mint, and he said that you could definitely taste the freshness of the mint in the sorbet. If it was anything like the mint in my mint cookies ‘n’ cream, then I had no doubt he could taste the freshness of the mint. The rum added a kick to the sorbet that my husband said you could definitely taste, but it also added the sweetness necessary to bring the icy sorbet together and pair it well with the fresh mint. For him, this was like what a mojito tastes like, but in an icy dessert format. 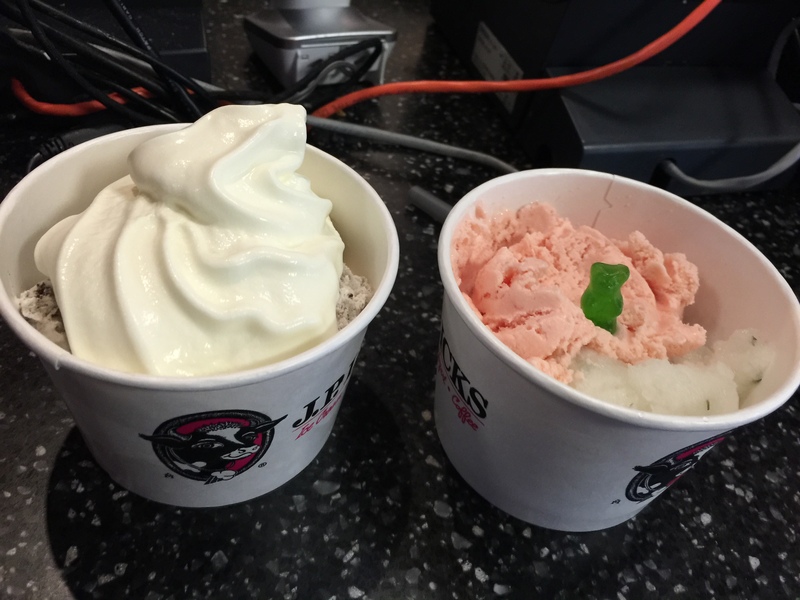 Smooth and refreshing, the watermelon sherbet and the mint mojito really were the perfect match for one another. 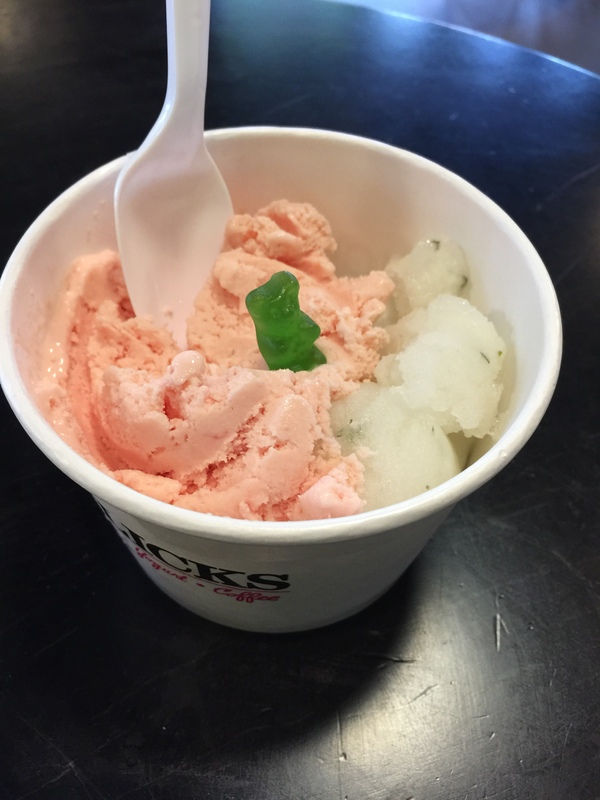 And my husband being the quirky guy he is decided to ask the employee behind the counter if he could get one single green gummy bear on his cup of ice cream because he thought it looked pretty. 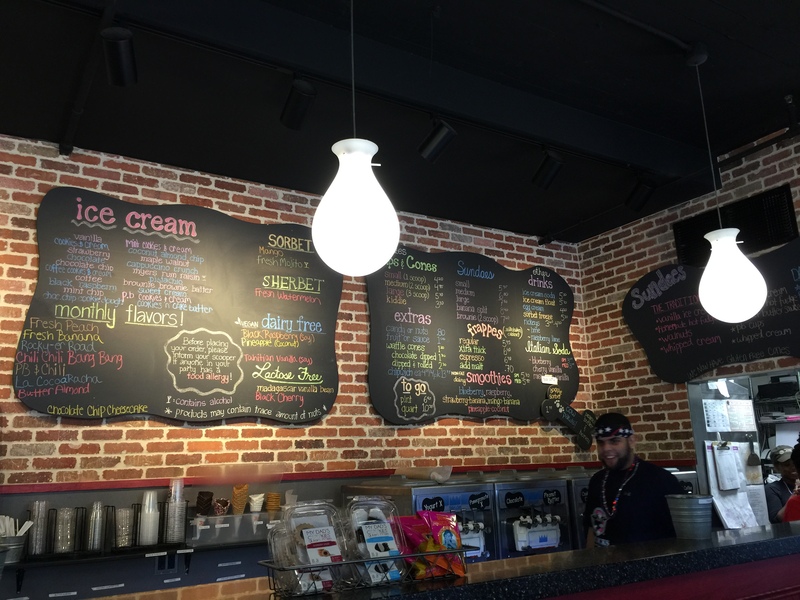 It was neat to just stumble upon this random ice cream shop and discover that it has this incredible story and history within the city, but also some of the best and most unique ice cream and sorbet flavors we’ve ever seen. And not only were the flavors unique and different, they were really good. My husband loved his mojito sorbet and I loved my banana ice cream. You can taste in the ice cream the fresh quality and flavor and you know it was made with fresh, local ingredients. I wish we had a place like J.P. Licks here in Southern California because I’d be eating gallons of that banana ice cream.